Really nice, solid cow with stunning colors! Horn color is a stand out. 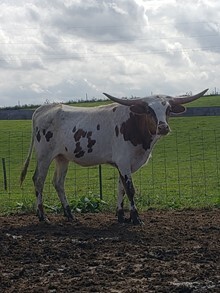 Dignity is bred to Hubbells 20 Gauge for a fall calf. Looking forward to building on the genetics of this young lady. SOLD TO DALE METZ OF FHR LONGHORNS IN DENTON TX THANK YOU !! !